The Sky's the Limit! - WEEKS ARE FILLING UP, SECURE YOUR VACATION FOR 2019!!! Magnificent oceanfront condo in family oriented Surfside Beach, South Carolina. This beautifully decorated oceanfront condo has over 1200 square feet in a town house design. This offers privacy with the living, dining and kitchen on one level and the bedrooms on the second level. The large living room has a queen sleeper sofa, ceiling fan, 50" Smart TV and beautiful glass doors that open to a furnished balcony to enjoy eating or relaxing so close to the ocean, you can almost touch it. The kitchen is completely furnished with dishwasher, microwave, disposal, ice maker, coffee maker, blender, and full-size appliances with all the accessories needed for cooking and enjoying your stay. The dining area has a large picture window as well as an oceanfront view of the ocean while you enjoy dining. There is also a half bath on this floor. The large master bedroom has a large palladium window that allows you to lay in the king-size bed and see the stars at night, and awaken to the sunrise and quiet roll of the ocean waves. The master bath also has a whirlpool tub for your pleasure. The second bedroom has a queen-size bed with another beautiful view of the ocean. The bathroom for this bedroom opens to the adjoining hall. Each bedroom has a TV, and a DVD Player ceiling fan and large closet. decorated condo for your enjoyment and pleasure. After playing on the beach, there is an outside shower area to rinse away the salt and sand. The pool has lounge chairs for lying in the sun while the kids swim. Since there is a small number of condos in this complex, this allows for more room on the beach without the crowds of high rise complexes. This is a NON-SMOKING condo and PETS are NOT allowed. VIOLATORS ARE SUBJECT TO EVICTION. Rates include linens, towels, beach chairs, umbrellas, beach buckets, toys and games. All of these amenities are included with no booking fees. Our family has been coming to Surfside Beach since the early 1950's when this small beach town was first established. It is a quiet family oriented beach that we enjoy as much today as we ever have. We love to relax on the beach, take a walk on the beach or just relax in the condo. We are a very short distance to some of the best restaurants on the Grand Strand and love eating out, but often cook and enjoy eating in as well. Shopping and enjoying the shows at the beach is also a great family activity. We use our condo as well so it is kept in the best condition as possible. Two full baths and one half bath. There is an unobstructed view of the beach from every room in this condo because we are on the direct ocean front! We are directly on the beach. Cannot get any closer than this. You can view the ocean from any room in our condo because we are on the direct ocean front! We are on the direct ocean front. No obstructions. Cannot get any closer than this! This is a lovely condo directly on the beach. We had a very nice stay. This was my sixth season to enjoy Pam and Tony’s beautiful condo. It is beautiful and well maintened. It is so clean and has everything that is needed to provide comfort and safety. It has a beautiful view of the Atlantic and the sunrises are breathtaking! It is located near many fine restaurants and a few are within walking distance. I hope to return to my home away from home. We love the Myrtle Beach/Surfside Beach area for summer vacation and have stayed in the area numerous times. Hands down, Pam and Tony's home has been our absolute favorite place to stay, and we have been fortunate enough to stay here several times. Situated on an absolutely gorgeous slice of oceanfront heaven, this immaculate home has everything you need to relax and unwind. Pam is very accessible and makes a point of checking in to make sure that all is well during your stay. We fully recommend and hope to come back very soon! We've stayed here several times over the years and the recent renovations have made an already great place even better. 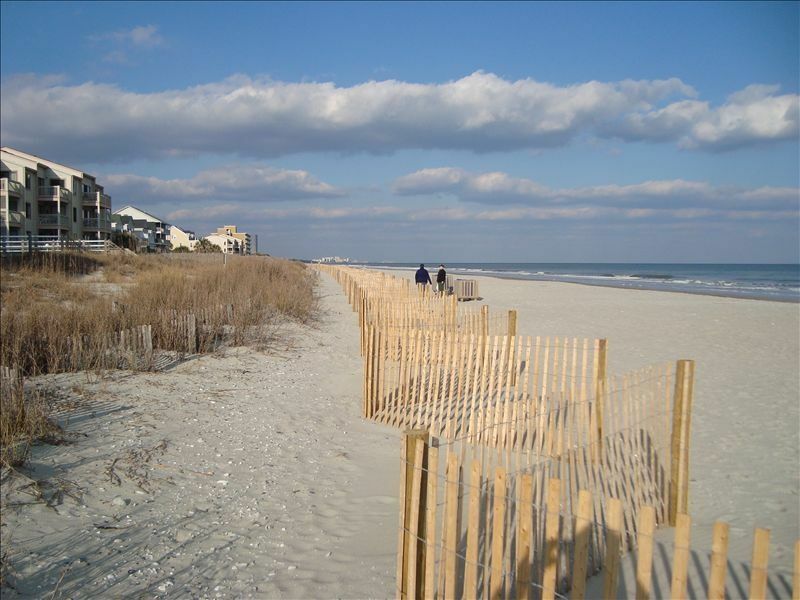 It's a perfect location for us with easy access to Myrtle Beach, Murrell's Inlet and Pawley's Island. I'm a golfer and no course is too far away. My family loves the beach and it's right outside. Chairs, umbrellas and anything else we need are provided so there's no need to pack too much. The owners have made the entire process as easy as can be. They are friendly and always available. We have friends who also stay here every year and we've never had any issues. We will definitely be back. This condo is perfect! We had 5 adults and never felt cramped! The location was great- Crabby Mikes is our favorite restaurant and it’s just a couple minutes away :) The kitchen is stocked with everything you need and the condo itself was super clean! We also loved having all of the beach chairs, boards and beach games available to us! We will definitely be returning! Thanks so much Pam and Tony! Wonderful experience for first time in Myrtle Beach! The condo was extremely comfortable and accommodating. The views from the balcony were gorgeous! Everything inside was very well kept, modern and extremely clean. The owners were very easy to reach and quick to answer any questions we had. We would recommend this location to anyone traveling to the area. Thank you so much for making our first stay in the area and first experience with renting a home a very memorable one! restaurants and entertainment along the way. Brochures in the condo of most of these attractions and menus from favorite restaurants. We charge 12% taxes that is added to each rental rate. There are no charges for using our linens and towels. We do not charge for Beach chairs, umbrellas, buckets, beach toys, boogie boards and games. These are all included in rental rates.